The Battery is one of Marsh's early oils, painted just after his three his three-year stint as a staff illustrator for the New York Daily News where he drew a daily column of theatrical sketches. At the time Marsh was involved in designing theatre curtains for "The Greenwich Village Follies" and he had recently collaborated with the set designer Robert Edmund Jones on curtains and sets for the Provincetown players. These facts are brought to mind by the stage-like look of this canvas. Three fashionably-clad women enter along the right foreground of the composition; next to the post in the left middle ground, three men at leisure are conversing. Three other men are looking out to sea in the distance. The background consists of blue sky, sea and nautical traffic in the port. The grey foreground, empty except for the figures just described, looks much like a stage with the sea and sky just a painted backdrop. In his early oil paintings, Marsh evidently recorded scenes that he observed first hand, while in later work he relied on sketches and photographs that he greatly altered in the creative process in his studio. Marsh later admitted that he had difficulty with his first paintings in oil. He began his career as a graphic artist and the transition to full colour and solid pigment brought complications. "I still shied away from oil, " he remembered, "the attempts I infrequently made ended always in an incoherent pasty mess..." Marsh found watercolour an easier medium in this formative period. Marsh's narrative skill is already apparent. 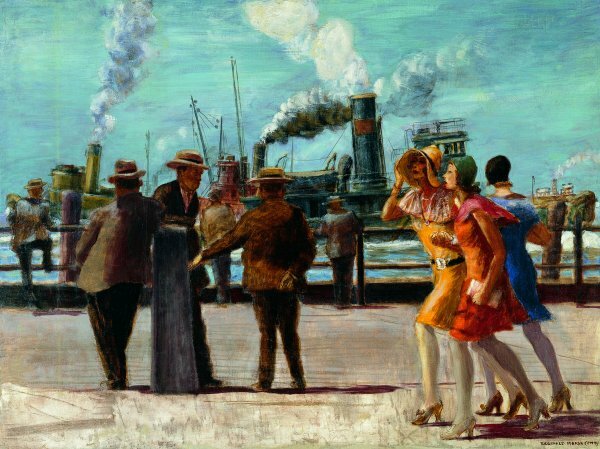 He dramatically conveys the effect of the wind with the billowing smoke from the tug boats in the harbour and one of the women holding on to her hat in the breeze. The tallest of the men conversing is momentarily distracted by the appearance of the three women and he gazes in their direction. The bright sunny day is conveyed by the clear bright colors and the shadows cast by the figures. In The Battery, Marsh depicted the public park of that name. Located on the southern tip of Manhattan Island, it offers a marvellous view of New York Harbour. The people are well-dressed; the men all sport hats and jackets and the women wear high-heeled pumps and the short dresses then fashionable among the "flappers" of the period called the "roaring twenties." Marsh possessed intense powers of observation and he would later develop a sharp wit and an ability to convey stunning social commentary and satire in his depictions of urban life. This early work is a more direct recording of what the artist observed and it is also much less crowded than Marsh's city scenes of the 1930s.